Today we’ve released a new version of HitmanPro 3.6 to our users. Build 159 includes many improvements over earlier releases. But I would like to blog about one particular new feature today: the detection of the XULRunner malware. This particular malware, a browser hijacker, affects the Mozilla Firefox browser and redirects Google Search results to e.g. happili.com. To get rid of this malware, HitmanPro build 159 (or newer) will detect and thoroughly remove the XULRunner malware, including its files, folders and registry keys. ADDED: Windows 8 Release Preview support. ADDED: Detection and removal of XULRunner redirect scripts. ADDED: /fb command-line option to perform Force Breach. ADDED: HitmanPro switches the desktop to ensure visibility. 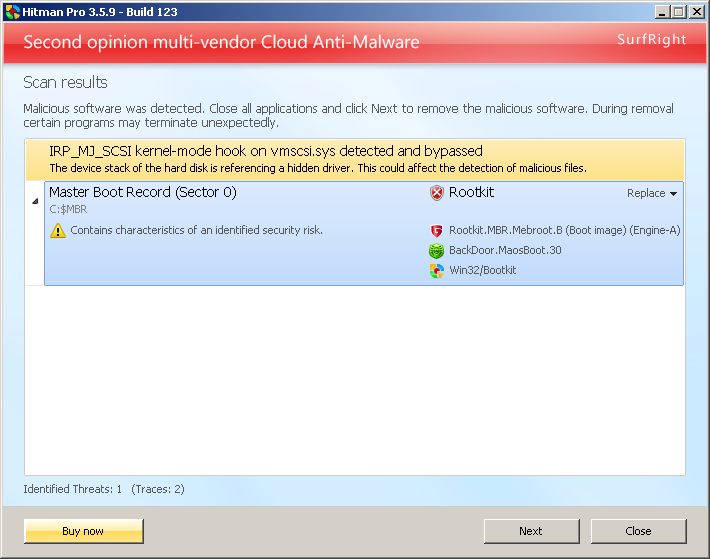 Some Ransomware use a dedicated desktop to prevent applications from popping up. IMPROVED: Force Breach to kill more processes. IMPROVED: Force Breach now works under SYSTEM or SERVICE account. IMPROVED: Detection and removal of ZeroAccess/Sirefef CLSID variant. IMPROVED: Improved removal of MaxSS bootkit. IMPROVED: Improved Volume Boot Record (VBR) handling. FIXED: A problem where Default scheduled scan would not scan for cookies. FIXED: SafeBoot Minimal was not working. FIXED: Behavioral scoring on WOW64 uninstall keys. FIXED: Compatibility issue with Dataplex caching software from NVELO. With great pleasure we announce the release of HitmanPro 3.6. The highlights of this release are a brand new Remnant Scan, a new Scheduler with more options, a new Shell Extension, revamped graphics and many improvements which make this release the best release yet. For the complete list of changes see the below changelog. Hitman Pro is now called HitmanPro. On Twitter use #HitmanPro. NEW: Added Scanning for Malware Remnants. This new feature scans the File System and Registry for common malware related paths (files, folders, keys). The Remnant Scan combines a multi-threaded local scan with cloud based confirmation. In 3.6.0 we are detecting only a few hundred remnants; more will be added to the cloud in the coming weeks. We are still fine tuning the tooling on the back end. NEW: Added new Scheduler to allow scanning Daily, At Startup, Mon, Tue, Wed, Thu, Fri, Sat, Sun at specific times. The scheduler is a process called hmpsched.exe. NEW: Shell integration by using a Shell Extension which adds an icon to the context menu and also allows multiple selected files to be scanned. NEW: Added ‘Goto location’ to context menu to highlight the file in Windows Explorer. NEW: Added ‘Show information’ to context menu to expose more internal information to the end user. Tip: the information can be copy-pasted. NEW: Added third opinion scan using VirusTotal. To use this feature you enter your personal VirusTotal Public API Key on the Advanced tab under Settings. NEW: Added detection for files signed with weak Authenticode signatures (RSA 512-bit keys). NEW: Added chevrons to highlight items in the result list that are running [PID] or start by [Run], [Service] or [Driver]. NEW: Added detection and repair for the HOSTS file that was altered by malware. NEW: Added /clean command line switch to automatically quarantine and remove malware. NEW: Added the option to disable the automatic upload of suspicious files to the Scan Cloud. IMPROVED: Removal of TDL4 (and variants) on systems where Boot Configuration Data (BCD) was persistently malformed by TDL4. Removing TDL4 from those systems could cause a non-bootable system (BSOD). HitmanPro now repairs BCD before removing TDL4 (or variants). IMPROVED: NTFS Parser to work better with heavily fragmented files. IMPROVED: Direct Disk Access now always scans using the lowest possible level. IMPROVED: Firefox and Chrome cookie scan. CHANGED: For regular users Early Warning Scoring (EWS) is no longer available from the Next button. Expert users can re-enable the EWS scan mode on the Advanced tab under Settings. INFO: 3.6.0 is currently only available in English. Hitman Pro 3.5 users will not be automatically upgraded since 3.6.0 is currently only available in English. Automatic upgrade of Hitman Pro 3.5 will occur with version 3.6.1. Installing HitmanPro 3.6 will automatically upgrade an existing Hitman Pro 3.5 installation. The main purpose of Hitman Pro 3.5.9 build 124 is the addition of the Cloud Assisted Miniport Hook Bypass feature. Cloud Assisted Miniport Hook Bypass feature. Removal of new variant of Trojan Vundo. Master Boot Record (MBR) protection when restoring infected MBR to counter rootkit watchdogs. Repair for BCD testsigning. Testsigning is a feature of 64-bit Windows that, when enabled, allows loading of non-signed drivers on 64-bit Windows. Testsigning is typically abused by 64-bit bootkits. The full release notes and changelog of Hitman Pro 3.5.9 build 124 can be found on www.surfright.com/hitmanpro/whatsnew. Existing users of Hitman Pro will automatically be updated to the latest version in the next few days. Hitman Pro 3.5.8 build 119 is now available for download. Existing users are automatically updated to the new build. New users can download from www.surfright.com/downloads.